The researchers found a way to make an "optical battery," said Stephen Rand, a professor in the departments of Electrical Engineering and Computer Science, Physics and Applied Physics. "You could stare at the equations of motion all day and you will not see this possibility. We've all been taught that this doesn't happen," said Rand, an author of a paper on the work published in the Journal of Applied Physics. "It's a very odd interaction. That's why it's been overlooked for more than 100 years." "This could lead to a new kind of solar cell without semiconductors and without absorption to produce charge separation," Rand said. "In solar cells, the light goes into a material, gets absorbed and creates heat. Here, we expect to have a very low heat load. Instead of the light being absorbed, energy is stored in the magnetic moment. Intense magnetization can be induced by intense light and then it is ultimately capable of providing a capacitive power source." What makes this possible is a previously undetected brand of "optical rectification," says William Fisher, a doctoral student in applied physics. 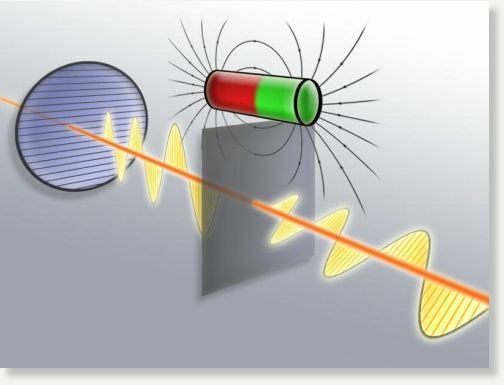 In traditional optical rectification, light's electric field causes a charge separation, or a pulling apart of the positive and negative charges in a material. This sets up a voltage, similar to that in a battery. This electric effect had previously been detected only in crystalline materials that possessed a certain symmetry. Rand and Fisher found that under the right circumstances and in other types of materials, the light's magnetic field can also create optical rectification. "It turns out that the magnetic field starts curving the electrons into a C-shape and they move forward a little each time," Fisher said. "That C-shape of charge motion generates both an electric dipole and a magnetic dipole. If we can set up many of these in a row in a long fiber, we can make a huge voltage and by extracting that voltage, we can use it as a power source." The light must be shone through a material that does not conduct electricity, such as glass. And it must be focused to an intensity of 10 million watts per square centimeter. Sunlight isn't this intense on its own, but new materials are being sought that would work at lower intensities, Fisher said. "In our most recent paper, we show that incoherent light like sunlight is theoretically almost as effective in producing charge separation as laser light is," Fisher said. This new technique could make solar power cheaper, the researchers say. They predict that with improved materials they could achieve 10 percent efficiency in converting solar power to useable energy. That's equivalent to today's commercial-grade solar cells. "To manufacture modern solar cells, you have to do extensive semiconductor processing," Fisher said. "All we would need are lenses to focus the light and a fiber to guide it. Glass works for both. It's already made in bulk, and it doesn't require as much processing. Transparent ceramics might be even better." The paper is titled "Optically-induced charge separation and terahertz emission in unbiased dielectrics." The university is pursuing patent protection for the intellectual property. because the blood must not be reaching your brain very well. The Textbooks are Minefields and Quagmires of lies. then vary the parameters, and measure the effects. The biggest shock in my life in Secondary School, was when we did the Physics experiments, and the results didn't fit the equations. The Teacher was like: "No matter how ell you set up the experiment, it is never going to fit the equation." I was like: "Wot?" Those who count the Votes determine Everything. If you guys have seen Wall Street 1 and 2, you might remember that a woman lets slip that "film" is the "technology of the future" and from inference film-based solar power generation/storage/transmission is the future. I would love it if my lil greenhouse zeps had amazing power-generating film on the top. They'd be a beautiful thing to see. If only 1% of the money that goes to the wars went to feeding the unfortunate, the world would be full of positive energy. But sadly, in our corrupt and dying world. Nothing is free. Did scientists finally learn this from observing how light and other forms of energy change when they enter our atmosphere? Does our atmosphere have a film-like effect too? By adding and depleting it of key elements, this property might easily change. This could explain chemtrails in part.